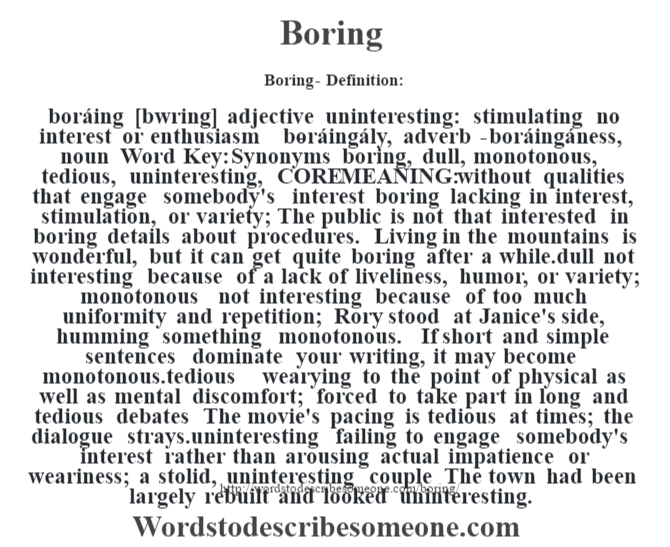 boráing [bwring] adjective uninteresting: stimulating no interest or enthusiasm -boráingály, adverb -boráingáness, noun Word Key: Synonyms boring, dull, monotonous, tedious, uninteresting, CORE MEANING: without qualities that engage somebody’s interest boring lacking in interest, stimulation, or variety; The public is not that interested in boring details about procedures. Living in the mountains is wonderful, but it can get quite boring after a while.dull not interesting because of a lack of liveliness, humor, or variety; monotonous not interesting because of too much uniformity and repetition; Rory stood at Janice’s side, humming something monotonous. If short and simple sentences dominate your writing, it may become monotonous.tedious wearying to the point of physical as well as mental discomfort; forced to take part in long and tedious debates The movie’s pacing is tedious at times; the dialogue strays.uninteresting failing to engage somebody’s interest rather than arousing actual impatience or weariness; a stolid, uninteresting couple The town had been largely rebuilt and looked uninteresting.